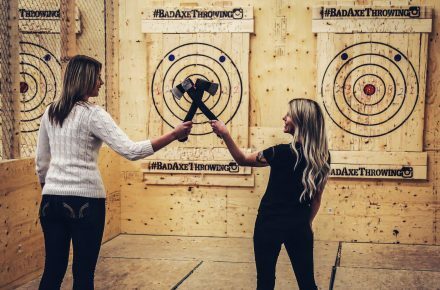 Bad Axe Throwing Kitchener Is Taking Off! Now an international company, we opened up Bad Axe Throwing Kitchener just 2 years ago as our second location. We’ve now expanded to 15, soon to be 18+ locations across Canada and the United States. Quite a wild ride over the last few years. 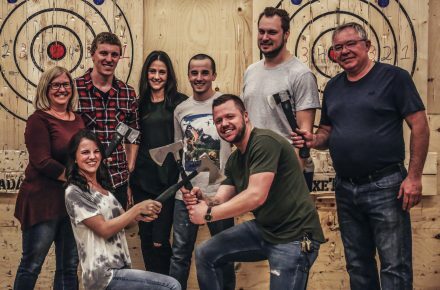 “In recent months, axe throwing has gained increasing momentum across North America, becoming ever more popular as the realm of recreation expands beyond stereotypical sports” – says Hannah Tellier of Imprint – The University of Waterloo’s Official Student Paper. We believe the sport of urban axe throwing is so popular, because it’s an activity anyone can do. You don’t need any previous skills or athletic ability. Similar to the sport of darts, participants are instructed to stand about 12 feet away from the target before launching the axe towards the bullseye. Our expert coaches teach and train you how to throw an axe, conduct fun games and show you an unforgettable experience. Bad Axe also hosts weekly league nights. “It’s not your typical Monday night bowling league,” said Matthew Belanger, axe master at the Kitchener location. This fall season will be the first season of participation in The World Axe Throwing League Championship. The champion and runner up from the Kitchener location will be invited to participate in the WATL finals. “Aside from the competitive aspect, there is a lot more depth to axe throwing…The culture that we’re trying to build around it is very supportive and very community-based,” Belanger said. What’s next on the horizon for Bad Axe Throwing? We have plans to open at least 2 more US locations before the end of the year. Additionally, we have ambitions for the sport of axe throwing to become an Olympic event. “Moving forward, Zelaya (owner of Bad Axe Throwing) has even bigger ambitions, and dreams for the day axe throwing makes it to the world stage” says Hannah of Imprint. With the winter season around the corner, we’re approaching it’s peak season! Don’t wait to book your next event or holiday party with Bad Axe Throwing Kitchener!